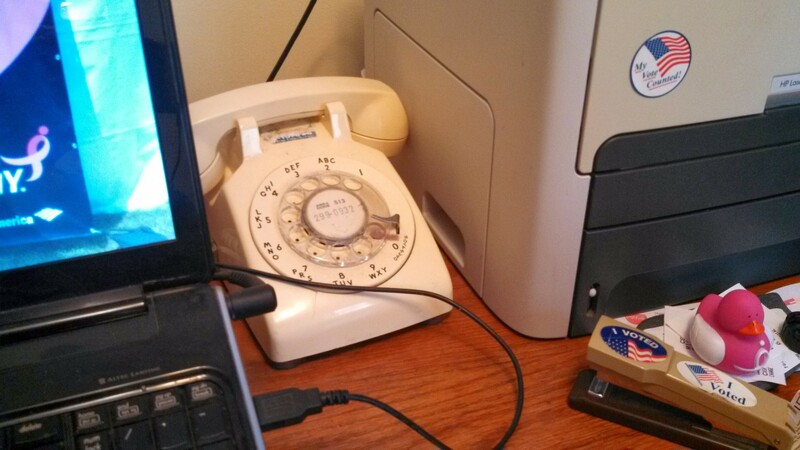 Yes, I’ve actually got an old rotary telephone on my desk in my home office. It’s functional and works for both incoming and outgoing calls. A couple of weeks ago, I got tired of the old $5.99 K-Mart corded phone that I had on my desk — its caller ID display had burned out, for starters, and it was light enough that it often got bumped off the hook by me pushing things around on my desk. So, I said “well, I still want a corded phone; when the power goes out, we need a least one phone that’ll still work.” So I plugged in Carole’s old phone. Granted, it’s not much use if I’m calling the power company to report an outage and need to press “1” to confirm that I’m calling from the location of the outage, but otherwise, it actually does work fine and for the time being, I’m sticking with it. There’s something very comforting about an old-fashioned Ma Bell phone. Now, if I could just get my computer to play a modem initialization tone every time I launch a Web browser.